Each year CORDIO aims to strengthen its internal capacity by growing its experience level, project portfolio and staff knowledge and skills base to more effectively and efficiently implement its strategic plan. In 2016 CORDIO received 4 new project grants and worked on a further 10 existing projects. Some of the projects had a regional focus but CORDIO also worked directly in 5 countries – Mozambique, Djibouti. Seychelles, Kenya and Comoros. As a leading marine research organisation in the region and globally, CORDIO and its staff members have been regularly invited to attend and participate at conferences across the world. In 2016, CORDIO staff attended over 25 conferences and workshops in over 15 countries including the 13th International Coral Reef Symposium (ICRS) held in Hawaii, the 2nd United Nations Environment Assembly held in Kenya, Global Conference on Climate Change Adaptation for Fisheries and Aquaculture held in Bangkok and the Regional Forum on Solutions for Oceans, Coasts and Human Well-Being in Africa held in Tanzania. CORDIO has developed a strong reputation as a reliable organisation over its 17 year history of effective grant and project management for a broad range of partners and donors. In 2016, CORDIO’s budget grew to $441,017 from $412,214 in 2014 and by 44% from 2015. The increase of funds was from both existing and new donors, with CORDIO managing a portfolio of 18 grants in 2016. 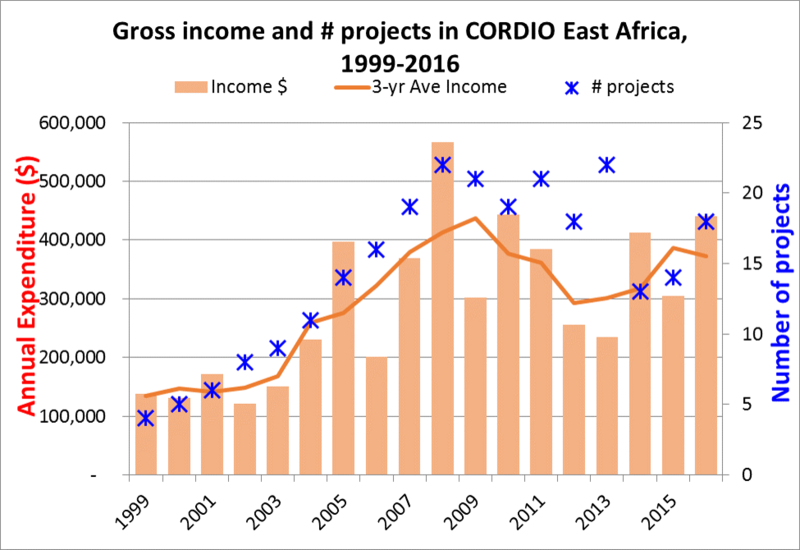 The summary of gross income and number of projects from 1999-2016 is presented in the graph on the right. In 2016, the CORDIO team constituted 10 full time staff in the Finance, Fish and Fisheries, Social Sciences and Corals and Reef Ecology departments and 8 associates. Both Directors hold Doctorate degrees, three staff members hold Masters degrees, three have Bachelors degrees and one staff member on leave of absence pursuing a PhD. 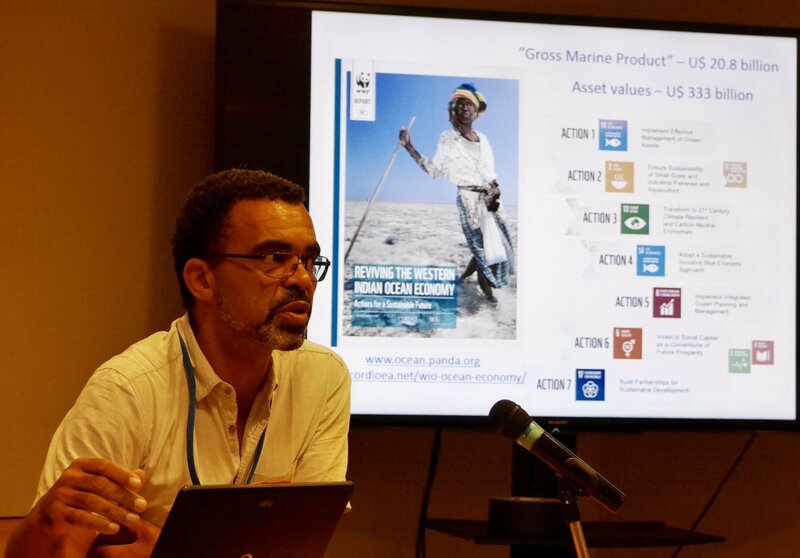 In 2016 CORDIO also established a new advisory board comprising of three marine conservationists who will assist the organization as ambassadors, in fund raising as well as in providing strategic direction.